Hey everyone!!! Are you ready for that amazing Thanksgiving dinner and all the wonderful family get togethers? This year, we'd like to help you prepare a bit further by offering a hop of prizes related to Thanksgiving, Fall and cooking! We should have something that will help you out on one or perhaps even all of the awesome blogs on the linky. Hosted by Crafty Zoo with Monkeys, there are several great prizes to be had so be sure and check them all out! Between the turkey, the dressing, salad, appetizers, pies.. sometimes it is hard to get those extra goodies in there that the kids love most.. COOKIES! With Shirley J Gourmet Cookie mixes you can easily make cookies to add to your holiday fare! I think that assortment will satisfy your entire family! The kids loved the sugar cookies, and what a time savor for making decorated cookies for Christmas! The Coconutty Macaroon was my favorite, and lucky for me the kids don't like coconut. Be sure you check the additional ingredients you need for the recipes. Nothing is hard to find, but plan on having it on hand when you go out to buy your turkey. These cookies are very moist, and taste like you bought them at a bakery. Make sure you pay close attention to the size of the cookie recommended and cooking time. Shirley J can give you the cookie mix, but you are going to have to be watchful in baking them. This product is a huge time saver, giving you more time for those friends and family visiting! Shirley J is giving away 1 of each cookie mix to 2 of my readers!! That is nearly a $50 cookie value each. They have some great muffins to cover turkey day breakfast! That way, you don't have to worry about anyone being in the way in the kitchen! I'd like to try the Classic Sugar Cookie Mix first. Oatmeal Jumbles sounds fabulous as I love oatmeal! I would try the oatmeal jumbles first. I'd try the Oatmeal Jumbles first. Yum!!! I would definitely try the oatmeal jumbles first followed by the sugar cookie. There is just something amazing about a really great sugar cookie!! Coconutty Macaroon would be my first choice. I would try the classic sugar cookie. I'd try the classic sugar cookie mix first- I can't for the life of me make good sugar cookies and would love to use cookie cutters with my son and decorate them for Thanksgiving! Coconut Macaroon looks great but so does the brownies! I'd try the New York B&W Cookies first! 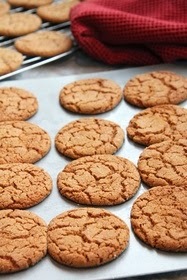 Soft Ginger Molasses Cookies first - perfect for fall! I'll try the Classic Sugar Cookie Mix. I would try Coconutty Macaroon first! New York B&W cookies, absolutely! Classic Sugar Cookie Mix is what I would like to try. The COCONUTTY MACAROON COOKIE MIX looks good. I would love to try the classic sugar cookie mix. Thanks. 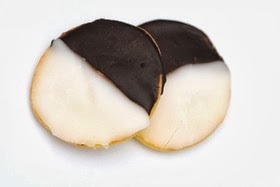 I absolutely love black & white cookies so I would try the NY B & W Cookie mix first. The coconutty macaroon sounds really good. I'd try the NY Black and White cookie mix. I'd go for the Soft Ginger Molasses cookies first. I'd try Coconutty Macaroon first. I'd try the Coconutty Macaroon Cookie Mix first! I'd like to try the Classic Sugar Cookie Mix first. Thanks. I would love to try the Coconutty Macaroons!! I would try the oatmeal jumbles cookie mix first. I want to try Classic Sugar Cookie first. Thanks for the chance. The Chocolate Muffin Mix sounds the best! I can pass up a classic sugarcookie! I would love to try the Classic Sugar Cookie Mix first! The Oatmeal Jumbles cookie looks really good! I want to try the soft ginger molasses mix. I'd try the classic sugar cookie mix. Thanks! The Oatmeal Jumbles cookie mix. I'd love to use the Soft Ginger Molasses Cookie Mix first. 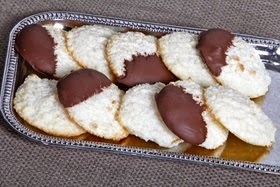 The Coconutty Macaroons look so good & will definitely be first! The NY Black and White would be my first. My mother always made these when I was a kid and I love them. I love coconut, so the coconut macaroons would be the ones for me to try first. I want to try the oatmeal jumbles first. The Ginger Molasses sounds really good. i think that the Oatmeal Jumbles sound really yummy but my daughter would probably go for the Sugar Cookies and she usually wins lol. We would all like the sugar cookies, so that would be first. We will try the oatmeal jumbles first it is my dear hubby's fave, then the new york black and white. Ohhh cookies. Thank you for the giveaway. I would try the macaroon! The Coconutty Macaroon would be my first to try. I would try the Coconutty Macaroons first. I'd try the oatmeal jumbles. I will be making the New York B&W Cookie Mix first, they are my Mom's favorite and we are having a surprise party for her 60th birthday next month. I would try Oatmeal Jumbles Cookie Mix first. Looks good! I would try the ginger molasses cookies first. ginger molasses would be the first to go here. the oatmeal jumbles cookie mix! I'd like the chocolate muffins. Thanks! the COCONUTTY MACAROON COOKIE MIX sound really good.